An MCL tear is a common knee injury and develops when the medial collateral ligament of the knee gets overstretched and damaged. The MCL is one of four ligaments that helps to stabilise the knee and is found on the inner side of the joint. A medial collateral ligament injury is most commonly caused by sudden twisting or a force through the knee, which damages some or all the fibres of the ligament and occasionally some of the other surrounding structures as well such as the knee cartilage. 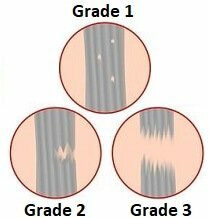 There are three grades of MCL tear depending on what proportion of the ligament is injured. 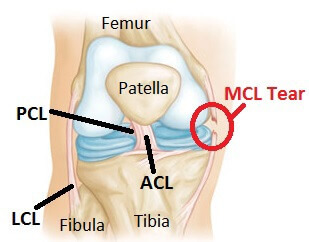 MCL injury symptoms include inner knee pain, swelling and instability. Here we will look at what causes MCL tears, the different grades of ligament injuries and their symptoms, treatment options, and what you can do to prevent long term problems after an MCL injury. 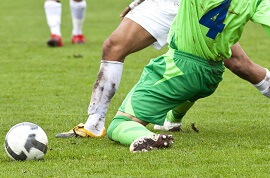 Knee ligament injuries are common, especially a tear to the Medial Collateral Ligament. The MCL is one of four ligaments that helps stabilise the knee and is found on the inner side of the knee joining the femur (thigh bone) and the tibia (shin bone). The function of the MCL is to hold the tibia and femur bones together and stop them moving apart on the inner side of the knee. This helps keep the knee nice and stable. 1) Contact: An MCL injury usually occurs when there is a force through the outer side of a bent knee, e.g. 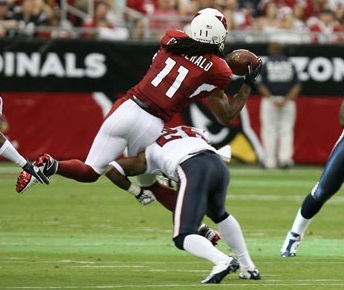 a tackle hitting the outer side of the knee. Symptoms: Grade 1 tears are usually tender on the inner side of the knee especially when any pressure is put through the region and bruising and mild swelling may develop over the first couple of days. There is unlikely to be any instability. Treatment: PRICE principles (protect, rest, ice, compression and elevation) are usually sufficient for treating a great 1 ligament injury. Visit the PRICE treatment section to find out how to make the best recovery. Treatment: PRICE first. Grade 2 ligament injuries may also benefit from using tubigrip compression bandage or a hinged knee brace in the short term if the knee is giving way to help provide stability and prevent further injury. 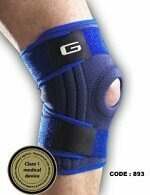 Treatment: A knee brace can be really helpful if the knee is feeling unstable. People usually find an advanced or elite knee brace most helpful as they help prevent any sideways movement at the knee. Your doctor may advise you to get one that prevents bending or straightening of the knee initially, depending on the severity of the injury. Braces are a great way to reduce pain and instability, improve function and prevent further MCL injury. Exercises should be done to help to increase movement, strength and circulation, all of which will lead to a quicker, fuller recovery. If you are wearing a brace, it should be removed several times a day to carryout exercises to ensure the knee does not get stiff. Crutches may be needed in the short term to keep weight off the knee when walking around. The crutches can stop being used once you can walk without a limp. Recovery: Symptoms often take 6-8 weeks to settle and it can take 3-4 months to fully recover from a grade 3 MCL tear. Recovery will be quicker if you keep up with your exercises. A combination of strengthening and movement exercises should be done daily - see the knee exercises section for suitable exercises. Remember, always consult your doctor or a rehab therapist after any injury to ensure the most effective course of action for you. An MCL injury can have a long lasting impact on the stability of the knee therefore affecting balance and knee function e.g. running on uneven ground and quickly changing direction, so it is important to rehab properly, particularly with grade 2 and grade 3 MCL tears. You may want to see a therapist for a rehab programme or try these exercises that you can do at home. But don’t worry, with proper rehabilitation, most people make a full recovery from all grades of MCL injury. As some of the fibres of the MCL connect to the medial meniscus, in more serious injuries this is often damage too - see the Meniscus Tear section for more information. Not Sounding Like Your Knee Pain? If you didn't twist your knee or don't have pain on the inner side of your knee, it is unlikely you have an MCL tear. If your knee pain was caused by a specific incident such as a fall, visit the Common Knee Injuries section. If your knee pain has come on gradually over time, go to the Common Knee Conditions section. An MCL tear is just one possible cause of inner knee pain so if you would like help working out what is wrong with your knee, visit the knee pain diagnosis section.